Earlier this year I met Jeff Power at an Ungeeked Conference where we were both speaking. We had an amazing breakfast my last morning, me, Jeff and Spike Jones. Jeff, works with Global Hope Network International helping the poorest villages of the world transform themselves. I love following his travel blog and videos and seeing in real time the difference they are making. Spike, is the writer and editor that gave Brains on Fire (one of my favorite books about igniting powerful, sustainable movements) message one voice. Spike and works with PR giant Fleishman-Hillard. You can probably imagine how cool and unforgettable that breakfast was.The three of us talked about movements, projects we’ve worked on and changing the world. I’m telling you this because 1) you should follow these guys, they’re like us and you’ll learn a lot. And 2) during that breakfast Jeff told me about ServeHope. Around this time of year (October & November), teams of ServeHope volunteers across the US will donate a day or their choosing to help local neighbors, while raising funds that help both local and global neighbors. All the world’s poor are our neighbors. Many are local, and even more are global where a billion exist on $1/day or less. I’ve been following the work Jeff is doing with GHNI, I know it’s making a BIG difference in places that just don’t have the resources like we do here in the states. And, I think they’re on to something with this ServeHope and I want to be apart of it. I started a ServeHope team “Be The Change Influencers”. If you’re looking to be apart of something meaningful before Thanksgiving you should join our team. We’re working on the calendar now where we’ll donate our day of time to local food banks around the states. Our team will also do a few different fundraising activities on and offline. Half of the money raised will help GHNI-USA towards their work against hunger in the poorest villages globally and half will go to Share Our Strength’s work to end childhood hunger here at home. You can check out our team page here. Join our team by registering here . Please select “Be The Change Influencers” as your team! Let’s use our Social Influence towards Social Good. Let’s apply our time, talents and passion this holiday season to meaningful work. Let’s be the change we wish to see in the world. I still meet people every day who wonder if Social Media will ever be anything of significance. I shake my head…They have no idea. Social media is a digital extension of our lives and the world we live in – EXCEPT- It’s this “social layer” that gives us UNBELIEVABLE SUPER POWERS. To date we’re only just seeing the beginning of these powers. Like the at-your-fingertips-power to organize millions of supporters to help win a political election (Obama), Like virtually connecting a country and the world to start a revolution (Egypt) . Like beaming your donations and support half a world away to victims of a natural disaster (Japan). All significant things done from PC’s, laptops and mobile phones all around the world. I’ve particularly developed a fascination, or maybe an obsession, for how we can use these super powers for good, ways to take digital influence, inspire movements and create meaningful change in the physical world. 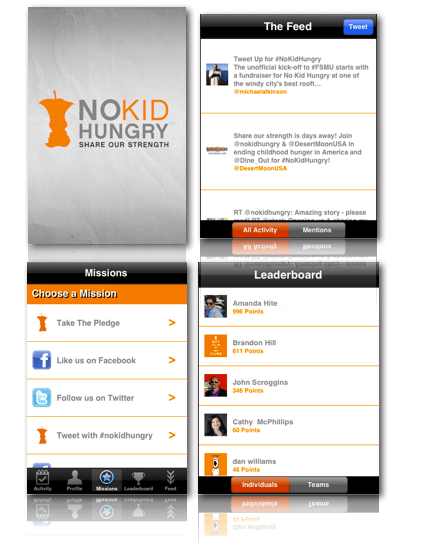 An examples of just that is Share Our Strength’s Dine Out for #NoKidHungry online movement. 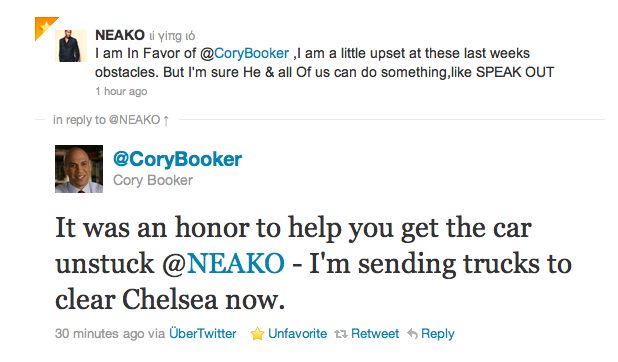 An Epic Example of Social Media for Social Good. 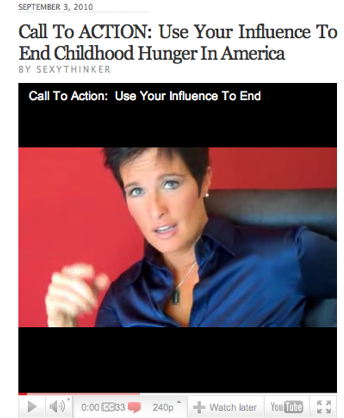 The call to action was focused: “Raise Awareness for the Dine Out for No Kid Hungry and drive consumers into participating restaurants.” We targeted the communities who care the most about this cause (the restaurant industry and it’s advocates) and went after online influencers and consumers who care and want to make a difference. Over 1,000 people helped spread the word, posting over 10,000 tweets about the campaign in just one week. 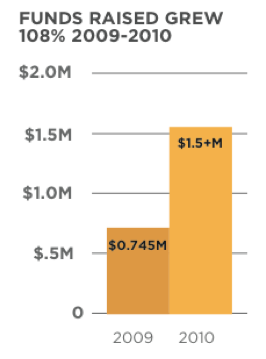 Those 1,000 contributors did their part to help Share Our Strength and the restaurant industry increase funds raised over prior year by 108%,raising 1.5 million dollars to help end childhood hunger in the United States. 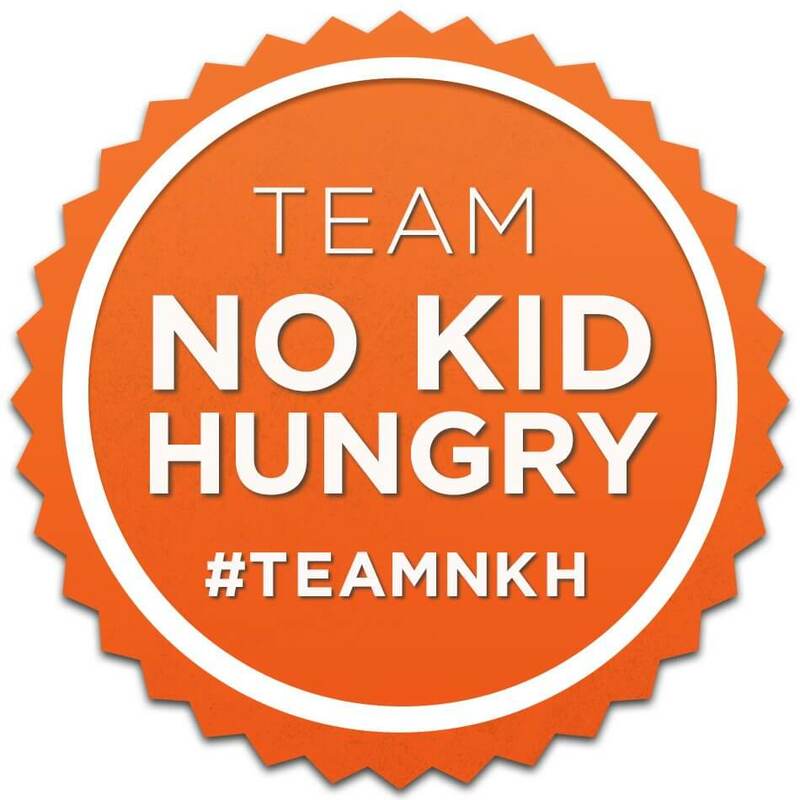 This year Share Our Strength’s goal for the Dine Out for No Kid Hungry is to raise 3 million dollars with help of 5,000 restaurants. So the team decided to rally our online advocates once again, but this time for restaurant recruitment. 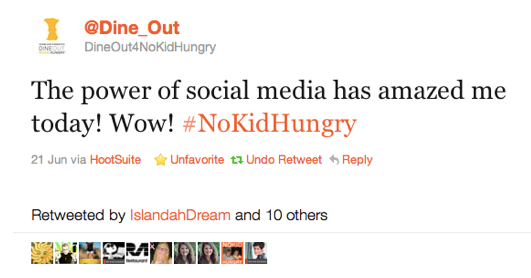 The single call to action this time: “Ask your favorite restaurant to participate in the Dine Out for No Kid Hungry.” We did “TwEAT Outs” where our online street team encouraged people to ask their favorite restaurant to participate in the Dine Out. Supporters shared their strength by asking their favorite brands in their own way to participate. The #NoKidHungry hashtag was the #2 Trending Topic on Twitter for 3 hours straight, ahead of the ever popular #TheVoice hashtag! 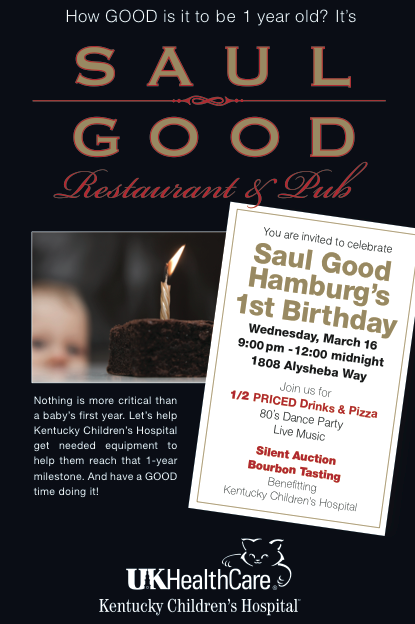 While this raised a ton of awareness for the cause, it also achieved results – getting 52 restaurant registrations during the time because of the TwEAT Outs. And generated dozens more leads and hiked interest among other restaurants. 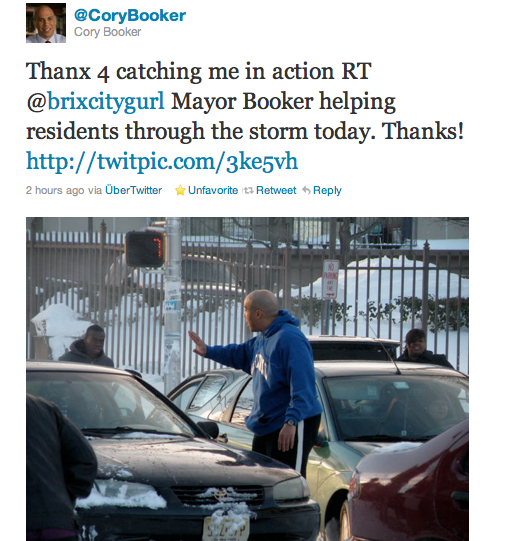 But… the thing that impressed me the most is how the cause bonded a community together. The Share Our Strength team brought together communities, advocates and influencers made it empowered them to make a difference and cheered them on along the way. In turn it bred a level of commitment from the community and made a powerful impact on the lives of all who participated in making this meaningful change. My question to you is this – how are you using your digital superpowers for good? 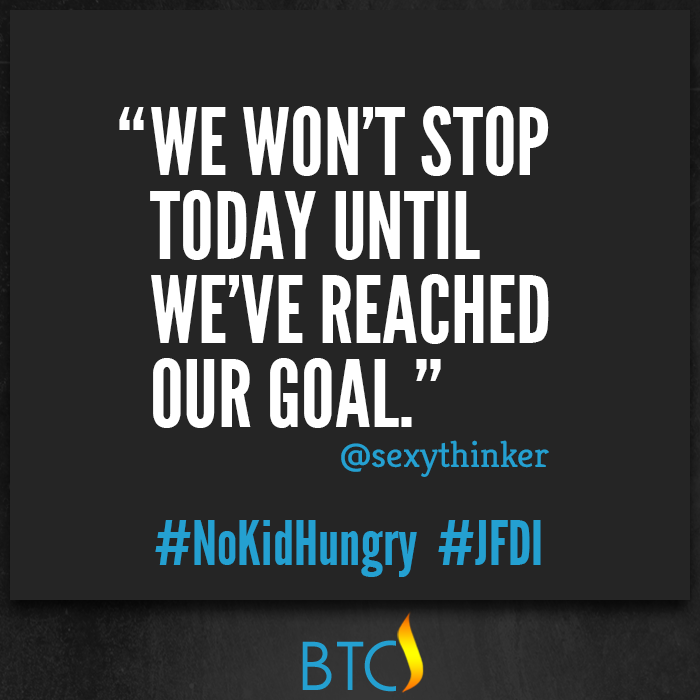 You can take the No Kid Hungry Pledge here to join this movement. You can join the Be The Change Influencers team to be a part of more movements like this one by clicking the join the revolution link at the top of this page. *We are preparing a special THANK YOU for all of you that gave and continue to give your time, talent, and passion to this cause. In the meantime I wanted to say thanks and give a special thanks to Jessica Northey who played a HUGE roll and set the example in this last TwEAT Out. 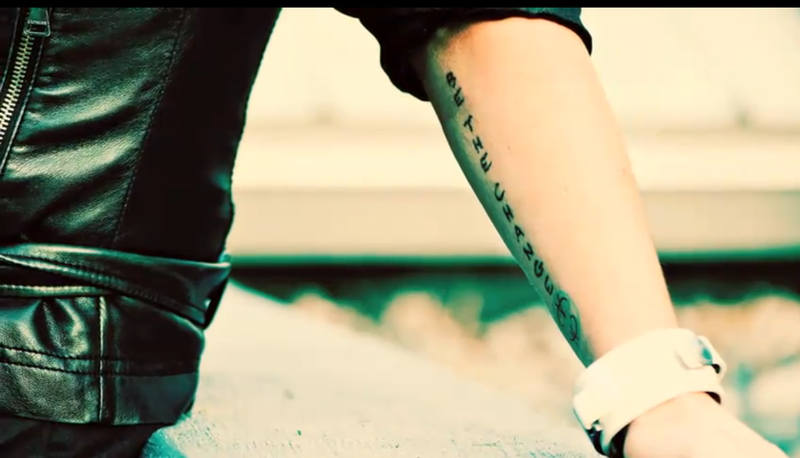 The results would not have been the same with out you. 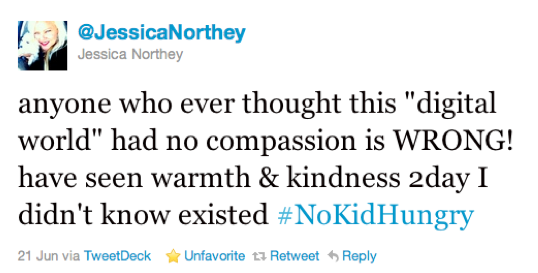 Thank you Jessica!